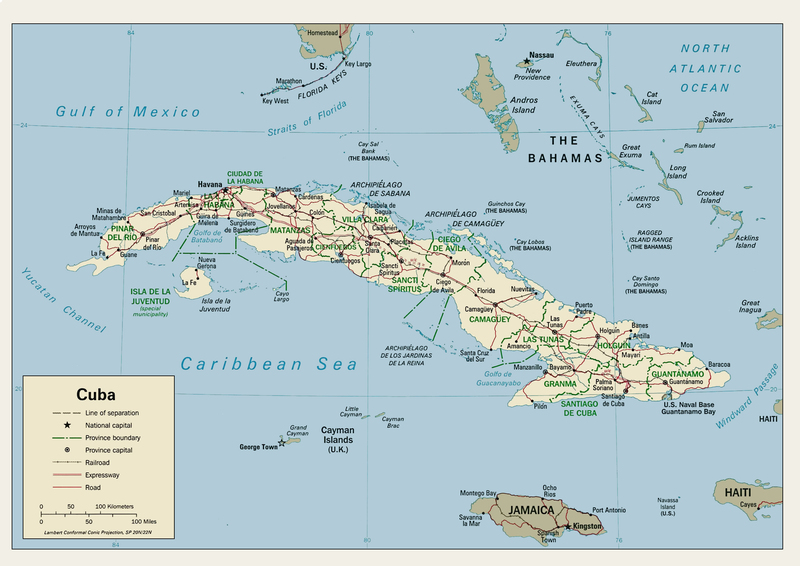 The island of Cuba, 1, 250 km long, 191 km at its widest point, is the largest of the Caribbean islands and only 145 km south of Florida. The name is believed to derive from the Arawak word "cubanacan," meaning central. Gifted with a moderate climate, afflicted only occasionally by hurricanes, not cursed by frosts, blessed by an ample and well distributed rainfall and excellent soils, it has traditionally been one of the largest exporters of cane sugar in the world. 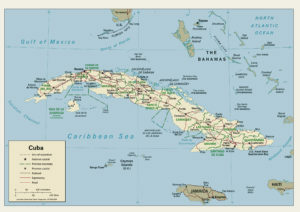 Geologically at least, Cuba is part of North America; the boundary between the North American and Caribbean plates runs east-west under the Caribbean Sea to the south of the island. Along the plate margin is a deep underwater rift valley, which runs between Cuba and Jamaica. This feature is quite close to the Cuban coast to the south of the Sierra Maestra, with water plunging to 6,000m deep only a few miles offshore. The northern coastline is gradually emerging from the sea. Old coral reefs have been brought to the surface, so that much of the northern coast consists of coral limestone cliffs and sandy beaches. By contrast, the southern coastline is being gradually submerged, producing wetlands and mangroves, with fewer sandy beaches than the north end of the island. Limestones of various types cover about two-thirds of the island. In most areas, there is a flat or gently rolling landscape. There are three main mountain areas in the island. In the west, the Cordillera de Guaniguanico is divided into the Sierra del los Organos in the west, with thick deposits of limestone which have developed a distinctive landscape of steep-sided flat-topped mountains; and the Sierra del Rosario in the east, made up partly of limestone and partly of lavas and other igneous rocks. Another mountainous area in central Cuba includes the Escambray mountains north of Trinidad, a double dome structure made up of igneous and metamorphic rocks, including marble. The Sierra Maestra in east Cuba has Cuba's highest mountains, rising to Pico Turquino (1,974m) a rather different geological history, with some rocks formed in an arc of volcanic activity around 50 million years ago. Older rocks include marble, and other metamorphics. Important mineral deposits are in this area; nickel is mined near Moa. © 2019 Cuba Cultural Travel. Site by Laura K Adams. Powered by WordPress.